Today, Apple® and Nike introduced Apple Watch® Nike+, the latest result of a long-standing partnership. 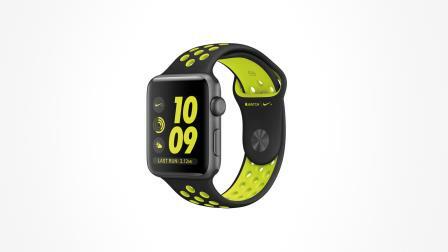 Apple Watch Nike+ is the ultimate tool for anyone who runs, pairing exclusive Nike Sport Bands with Apple Watch Series 2, which features GPS, a two-times-brighter display, water resistance 50 meters,* a powerful dual-core processor and watchOS® 3. Apple Watch Nike+ also includes exclusive Siri® commands and iconic Nike watch faces along with deep integration with the new Nike+ Run Club app for unrivaled motivation to go for a run, coaching plans that adapt to your unique schedule and progress, and guidance from the world’s best coaches and athletes. Apple Watch Nike+ is the ultimate companion for those with a passion for running, whether they’re emerging runners or marathon veterans. Apple Watch Nike+, like all Apple Watch Series 2 models, features built-in GPS to track pace, distance and route, so users can run without an iPhone®. With the brightest display Apple has ever made, metrics are easy to read, no matter the sun’s glare, and if users decide to take a post-run dip in the pool, Apple Watch Nike+ is water resistant 50 meters, for swimming. The Nike Sport band is crafted from the same strong, flexible fluoroelastomer as the original Apple Watch Sport™ Band, but now it’s perforated for even better ventilation and sweat management. The lightweight band is available in four vibrant, two-tone color combinations that are unique to the collection. Apple Watch Nike+ features two exclusive watch faces inspired by Nike’s iconic style that can be easily personalized with useful apps like Activity Rings, Heart Rate, Stopwatch and Weather, helping runners stay informed at a glance. Apple Watch Nike+ takes advantage of the unique capabilities of Apple Watch Series 2 and the Nike+ Run Club app to be the perfect running partner on your wrist. The app experience is seamlessly built into Apple Watch Nike+ and easily accessed right from the watch face, so users can get going with a quick tap. The Nike+ Run Club app offers daily motivation through smart run reminders, challenges from friends and even alerts informing when the weather is right to get outside. Training data, including pace, distance and heart rate are available at a glance, and through shared run summaries, the app promotes friendly competition, even allowing users to send fist bumps to each other right from the wrist. 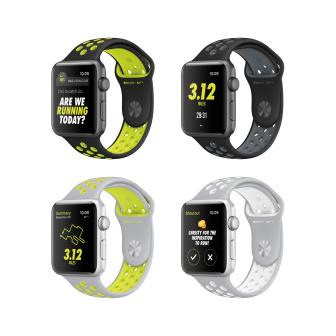 • Apple Watch Nike+ will be available in two different aluminum case sizes, 38 mm and 42 mm and pairs with four exclusive Nike Sport Band color combinations including Black/Volt, Black/Cool Gray, Flat Silver/White and Flat Silver/Volt. • Apple Watch Nike+ will be available in 38 mm at $369 (US) and in 42mm at $399 (US) from Apple.com, Nike.com, Apple Stores, select Nike retail stores, select Apple Authorized Resellers and select specialty stores and department stores. • Apple Watch Nike+ will be available to order on Apple.com beginning Friday, September 9, with availability in late October, in Australia, Austria, Belgium, Canada, China, Costa Rica, Denmark, Finland, France, Germany, Hong Kong, India, Ireland, Israel, Italy, Japan, Luxembourg, Mexico, Netherlands, New Zealand, Norway, Poland, Portugal, Puerto Rico, Singapore, Spain, Sweden, Switzerland, Taiwan, UAE, the UK and the US. • Apple Watch Nike+ will be available to order on Apple.com beginning Friday, September 23, with availability in late October, in Czech Republic, Greece, Hungary, Macau, Poland, Qatar, Russia and Saudi Arabia. • Nike Sport Bands are available exclusively with Apple Watch Nike+ models and not sold separately. • Apple Watch Series 2 requires iPhone 5 or later running iOS 10 or later. watchOS 3 and iOS 10 will be available beginning Tuesday, September 13 as a free software update. Some features are not available in all regions or all languages. • Every customer who buys Apple Watch Nike+ from Apple will be offered free Personal Setup, in-store or online,** to help set up and personalize their new Apple Watch with calendars, notifications, apps and more. • Anyone who wants to learn more about Apple Watch Nike+ or watchOS 3 can register for the free workshops offered at every Apple Store®. *Apple Watch Series 2 has a water resistance rating of 50 meters under ISO standard 22810:2010. This means that it may be used for shallow-water activities like swimming in a pool or ocean. However, Apple Watch Series 2 should not be used for scuba diving, waterskiing or other activities involving high-velocity water or submersion below shallow depth. Stainless steel and leather bands are not water resistant.